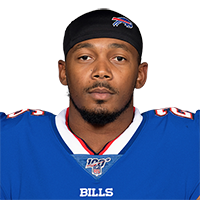 Published: Sept. 24, 2017 at 03:32 p.m.
Buffalo Bills defensive back E.J. Gaines intercepts Denver Broncos quarterback Trevor Siemian's pass. Published: Aug. 17, 2017 at 09:16 p.m.
Buffalo Bills cornerback E.J. Gaines picks off a pass against the Philadelphia Eagles. Published: Oct. 9, 2016 at 05:20 p.m.
Buffalo Bills running back LeSean McCoy sprints down the middle for a gain of 53 yards.